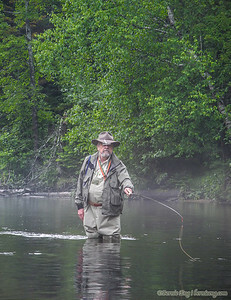 I'd never been to Keystone Landing on the AuSable River, and I'd never met another Tenkara angler. 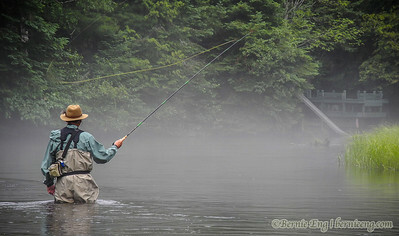 But there were two fishermen at Keystone using Tenkara when I arrived. So I did the prudent thing and invited myself to their party so I could learn a trick or two. 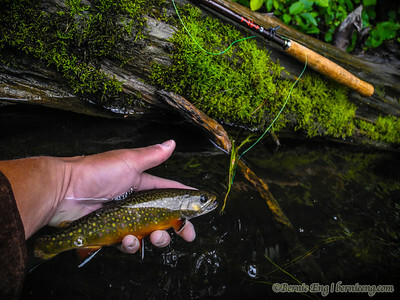 Thanks for the lessons, guys from Toledo, they paid off...I picked up one brown during the downpour and that beautiful brookie after the rain stopped. That brook trout though, was textbook perfect. The way the sun lit him up, I could watch him come up from his lair under the log, swim through two feet of water and grab that fly, smooth as can be! 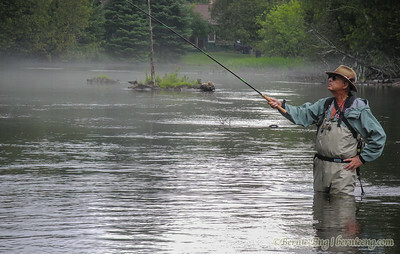 Anyway, thanks for all your Tenkara tips you shared, and enjoy your stay in Michigan. Good rain here, just before the downpour at Keystone Landing. 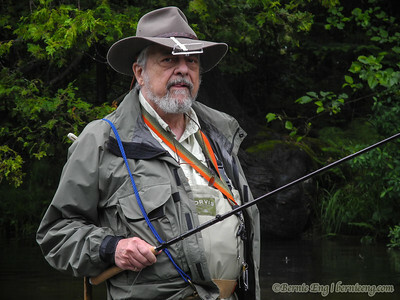 Those long Tenkara rods make for a nice, lightweight, easy-to-handle package. 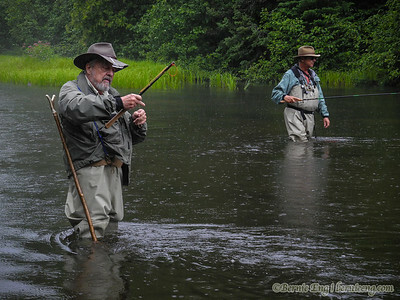 The Toledo guys do the Tenkara Dance. 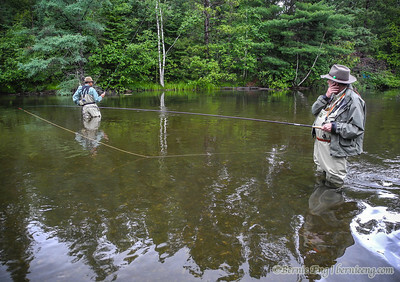 This stretch of the AuSable is perfect for this style of fishing. 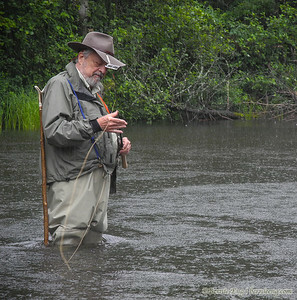 If there was a JC Penney ad for the perfect Tenkara outfit to wear in the rain, this is what you would see. The mist rolls in and the cast rolls out. 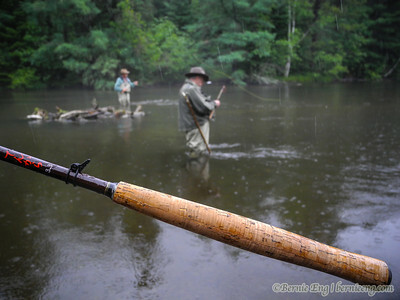 The rain has arrived, so it's time to break down the rod and head out. 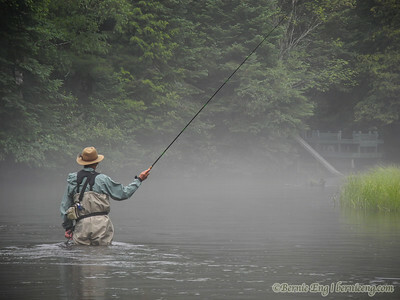 That long Tenkara rod really stands out against the mist on the AuSable River. 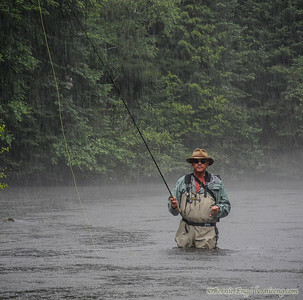 Catching the last few drifts of the fly as half the team pulls the system together to get out of the rain. 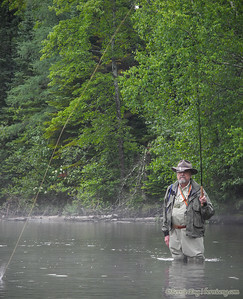 I have to get in the picture somehow, just to show there are three Tenkara anglers in the same stretch of the AuSable. It was nice to finally be the majority. Thanks for letting me crash the party! This fellow was hungry after the downpour stopped and the water was calm. It's the first time I was able to watch a fish leave it's lair and swim through two feet of water to grab its meal. Awesome!